Simply Put, We Do It To Live A Better Life. The single physical attribute that is associated with a long, active, engaged and satisfying life is strength. When it comes to strength, we underestimate the impact it has on our everyday lives. We require strength from the time we get out of bed to the time we go to bed. As your strength declines, everything from your metabolism to coordination to bone density to balance declines. You're fatigued by even a modest amount of physical activity. Your body fat increases, your blood sugar goes up, your blood pressure goes up. The next thing you know, you're taking medications to manage it all and complaining about feeling tired all the time. Muscle is your body's engine. Your heart is your body's fuel pump. The stronger, more powerful the engine, the stronger and more powerful the pump will become. But, its a "use it or loss it" proposition. This image shows MRIs for three different men. The top is an active 40 year-old. The middle is a sedentary 74 year-old and the bottom is an active 70 year old. Don't get hung up on the "triathlete" description. 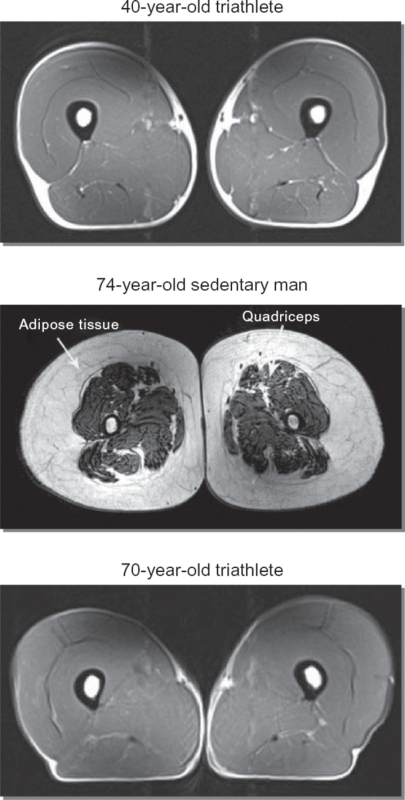 The point is to contrast the effects of being sedentary on muscle mass and strength and illustrate that a 70 year-old can maintain almost as much muscle as a 40 year-old. These biomarkers indicate you're biological age. The worse they are, the older you are despite your chronological age. Resistance Training To The Rescue! 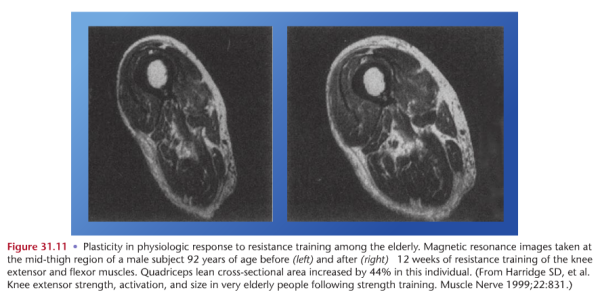 This image is from research on the response to resistance training among the elderly. As you can see, this man, age 92 increased the size of his thigh muscle by 44%!! That also means that he got considerablly stronger. The average strength increase in those tested was 134%. You can read about the incredible results here. If a 92 year-old can experience this kind of progress, image what you could accomplish. Effective resistance training is THE BEST, most time-efficient way to turn back the clock and look, feel and perform years younger than you do now. Want to Experience it Yourself for Free? Simply drop your details in the form below and I'll be intouch.